If you need a tablet and a phone but don't fancy lugging two gadgets, Samsung company has been surprisingly successful attempting to meet the ongoing consumer demand of bigger handsets by refining phablet formula with Galaxy Note 3 release. The note 3 is obviously an interactive product in 5.7-inch screen, active digitizer pen, much faster SoC, higher resolution display, better camera, and other improvement formula you’d expect. Given the large size, watching video is vibrant since improved brightness and contrast really make images pop, and the viewing angles are wide. The big question in terms of video playback on Galaxy Note 3 is, "Does it support HD videos like MKV, M2TS, MTS etc?" — As far as the video specs are listed in official pamphlet including: 3gp, 3g2, mp4, wmv(asf), avi, mkv, flv. To play HD videos AVCHD, M2TS, QT HD and more general videos like MOV, MPEG, M4V on Galaxy Note 3, you need a smart video converter for Samsung Galaxy Note 3 to fulfill diversity video conversion confounding. 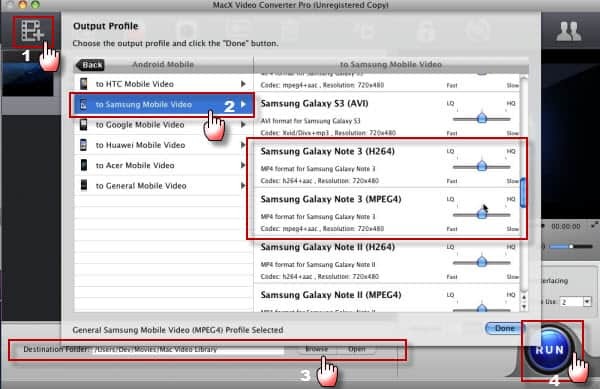 MacX Video Converter Pro is specific designed for Galaxy series flagship to convert videos to Galaxy Note 3 compatible format from all popular HD videos MKV, M2TS, MTS, TS, AVCHD and general videos MP4, MOV, FLV, WMV, AVI, etc. With this customized Galaxy Note 3 video conversion tool, you can watch all your favorite videos and even your recorded video clips by carrying around this handset. Before starting Galaxy Note 3 video conversion, you should just free download this Galaxy Note 3 video converter and run it on your Mac. Tips: This video converter for Samsung Galaxy Note 3 can run faultlessly on Mac OS 10.5 and higher even Mavericks likewise. Click "Add Video" or drag video file directly to import video you would like to convert for playback on Galaxy Note 3, such as M2TS, MTS, AVCHD, MPEG, MP4, MOV, FLV etc. 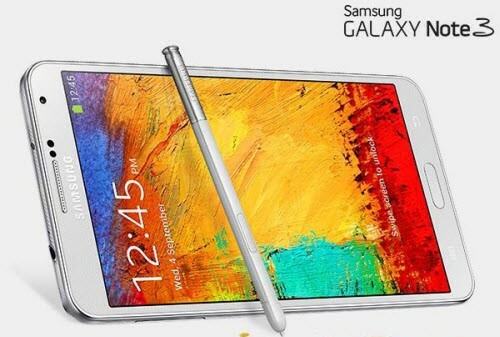 Select Galaxy Note 3 profile from Android Mobile profile library > Samsung Mobile Video. The default setting of General Samsung Mobile Video (MPEG 4) is workable for Note 3, or you could alternatively choose Galaxy Note 3 profile. If you want to clip, crop or add subtitle to your video, click "Edit" button to jump to editing interface. Step 3. Define Destination Folder. Choose the output folder you want to store the output files. Press "Run" button to start converting videos to Samsung Galaxy Note 3 device you have. After conversion, you can easily find your output video by clicking "Open Folder". In addition to video conversion feature for Samsung Galaxy Note 3, the built-in YouTube downloader could assist you in downloading videos from YouTube, while photo slideshow maker embedded lets you turn photos into a stunning video slideshow for playing on Galaxy Note 3 as bounty function.